I was craving Indian flavors this week. Something simple and fast to put together and, especially, a meal that wouldn’t leave me clutching my overstuffed belly. I adore Indian food — the bold spices (especially cardamom and cumin), the rich creamy sauces, super spicy pickles, sweet tamarind and mango chutneys and the chewy naan bread. But we always seem to order too much when we go to Indian restaurants. Invariably, I reach that point where I’ve had quite enough to eat but somehow can’t stop myself from having another bite or two. Or five. Another piece of naan? Oh, um, well….sure, go on. By making an Indian-inspired dish at home, I figured I could indulge in the bold flavors I enjoy so much while controlling my portion size. And accompanying the main dish with some greens instead of rice and naan bread. A lighter twist. Luckily we had some Pataks Madras Curry Paste waiting patiently in the fridge. Turning to one of my favorite techniques for small cuts of meat — sauteing first, then roasting in a hot oven — made this a super fast, and intensely flavorful, weeknight meal. Score! The minted yogurt is a small addition, but in my opinion it’s an essential part (and I’m not a big yogurt eater). 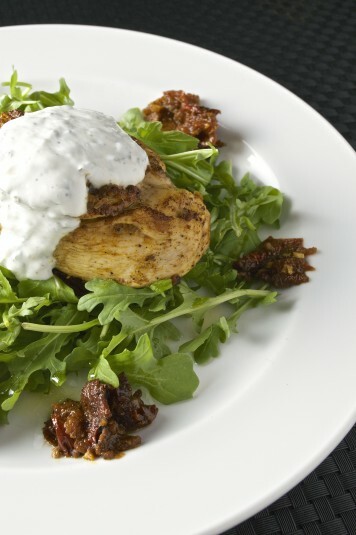 It brings a lovely cool contrast to the smoky curry flavor of the madras sauce and the crisp arugula leaves. And, I’m proud to say, my portion control was, well, controlled. So it is possible, after all. I’ll have to remember that the next time I’m out at an Indian restaurant. Fast and flavorful, this is an easy way to work in some Indian spice any night of the week. The cool minted yogurt helps bring the whole dish together. 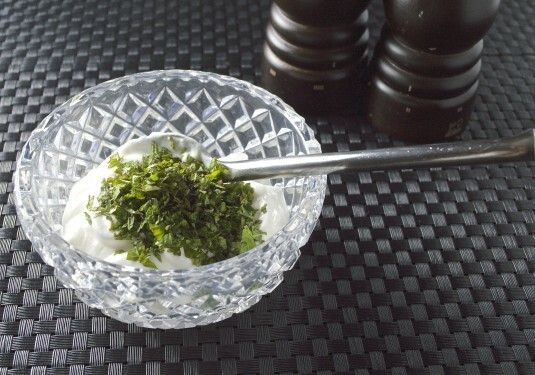 First, prepare the minted yogurt: Combine yogurt, chopped mint, lime juice and salt and pepper in a small bowl and stir to combine evenly. Set aside until serving time. Heat 1/2 tablespoon oil in medium ovenproof sauté pan over medium-low heat. Add ginger and garlic and sauté for 1 minute or until softened slightly. Add madras paste and tomatoes and stir to combine. Increase the heat to medium, and move the tomato mixture to the sides of the pan. Add the other 1/2 tablespoon oil, then the chicken breasts. Sear the chicken on one side (about 2 minutes), then turn it over to sear the other side (1 more minute). Stir in 1/2 cup chicken stock to the tomato mixture, then put the sauté pan in the oven. Bake for about 7-9 minutes, or until chicken is cooked to 160F. 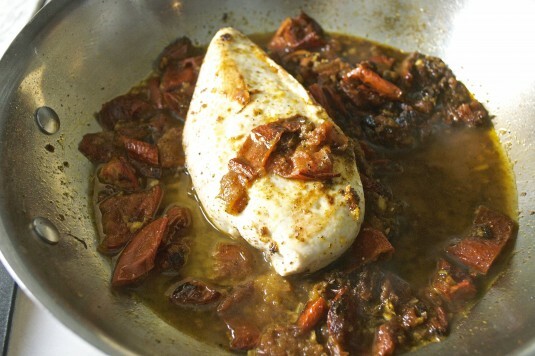 Remove the sauté pan from the oven, place a heat-proof oven mitt over the handle, and remove chicken breasts to a plate. Cover chicken with foil to keep warm while you finish the madras sauce. Over medium heat, add the other 1/2 cup chicken stock to the pan. Stir the sauce and reduce slightly, about 2 minutes. To serve, place 2 handfuls baby arugula on each plate and drizzle with olive oil. 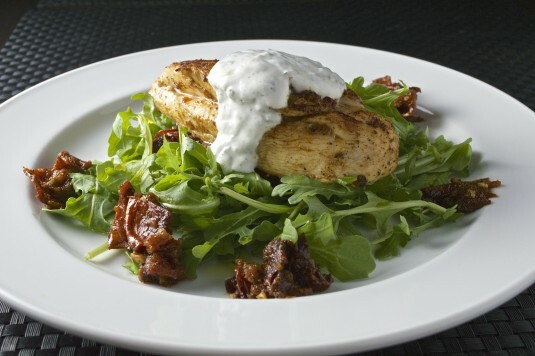 Place the chicken in the center of the arugula, and spoon some minted yogurt on top of the chicken. Add a few spoonfuls of the madras sauce around the side of the plate. If you haven't got any roasted tomatoes on hand, substitute chopped fresh tomatoes. You will need to cook them down more before searing the chicken, and you might need less chicken stock.